We are really to announce you that we have launched our new Facebook profile. We are aware of new trends in social media and we would like to be closer to our clients and fans as well. In the end we would like to connect four different media - starting with our Facebook profile through our Blog and our Twitter account and ending with our Prague City Apartment website. We believe our new stragery on the field of social media will increase client´s satisfaction and on the other hand it will atrack new ones. We are more than happy to announce that Residence Karolina has been rewarded by Tripadvisor. It has gained mark of Top Value. 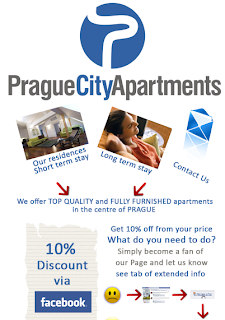 We are proud to offer you stay in one of Top rated properties for such price. Please check, what does it mean exactly by Tripadvisor: "A great deal for the price, as judged by millions of travelers." Top Value award is not just about price but it is the result of outstanding services and great location. Although the credit was assigned to Residence Karolina other residences are placed on the top positions on Tripadvisor as well. We would like to thank you for your the trust you gave us and we will to our best to continue in making your stay easy and enjoyable.